These ends are for use with Earls Super Stock or Aeroquip push on hose only. 250 PSI max. 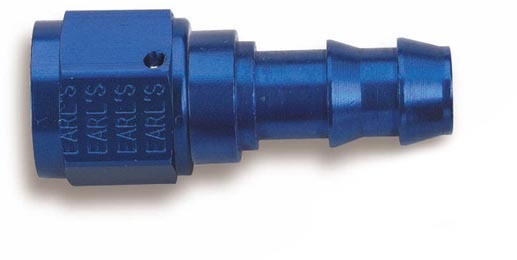 NOTE: XRP ends will not work with the Earl's Hose in -4 -6 & -8 sizes. Make sure to watch our tech video on installation techniques. 700145ERL 1/4 -4 Straight Super Stock Hose End. Aluminum. Collar sold separately. 700167ERL 3/8 -6 Straight Super Stock Hose End. Aluminum. Collar sold separately. 700109ERL 1/2 -8 Straight Super Stock Hose End. Aluminum. Collar sold separately. 700111ERL 5/8 -10 Straight Super Stock Hose End. Aluminum. Collar sold separately. 700113ERL 3/4 -12 Straight Super Stock Hose End. Aluminum. Collar sold separately. 704645ERL 1/4 -4 45 Deg. Super Stock Hose End. Aluminum. Collar sold separately. 704667ERL 3/8 -6 45 Deg. Super Stock Hose End. Aluminum. Collar sold separately. 704609ERL 1/2 -8 45 Deg. 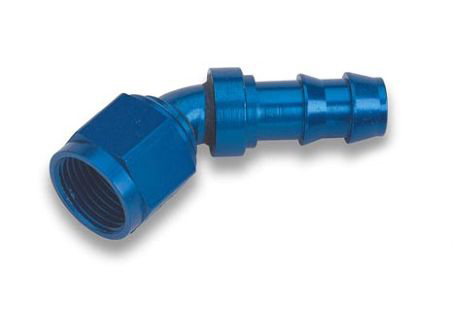 Super Stock Hose End. Aluminum. Collar sold separately. 704611ERL 5/8 -10 45 Deg. Super Stock Hose End. Aluminum. Collar sold separately. 704613ERL 3/4 -12 45 Deg. Super Stock Hose End. Aluminum. Collar sold separately.